The recycled materials for these wearable sculptures come from a local daycare. A Brooklyn artist called Ventiko is creating intricate, highly detailed costumes from discarded milk cartons. Though she started out as a photographer, Ventiko began creating the wearable milk carton sculptures after her mother was diagnosed with breast cancer in 2001, according to a NBC New York report. She started by collecting the milk cartons from a nursery near her home in Bushwick after they were thrown out. She took them home, washed them, and began experimenting with different art projects using the cartons as her medium. At first, she tried stapling the cartons together, but those creations fell apart, so she began sewing them together. Ventiko’s first milk carton costume show happened in 2011. Since then she’s gone on to display the dresses in galleries and even at Bushwick United Nursery School, the place where she first began gathering the cartons. Ventiko created the performance art piece Sylva Dean and Me to showcase wearable sculptures. Three characters wear the milk carton costumes during performances. The characters are silent and communicate with the audience only through gesture. 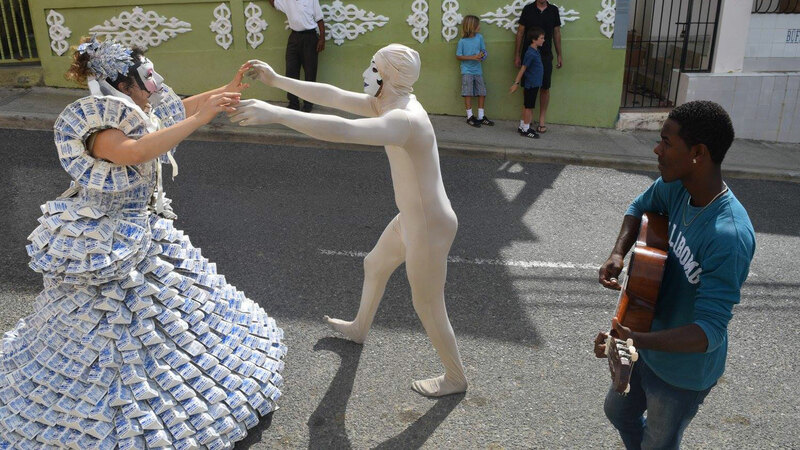 Though the collective has performed at art galleries throughout the city, Ventiko says that performing in the milk cartons for the children who once drank from them has been an even greater privilege. The Sylva and Dean performance will take place on June 17 at Maria Hernandez Park in Bushwick.